That the Swedish parish organisation could be used for political purposes in early modern Sweden is something that historians are already well aware of. For example, the appointment of parish clergy was an issue that could antagonize the parishioners and make them turn to the diocese or even to the King-in-Council. The challenge of clergy appointments could involve meetings with diocese representatives as well as supplications and delegations from the parish to the capital in order to persuade the authorities of one clergyman’s suitability over another. Likewise, the right of disposal of local resources, such as wood, could make parishes go toe to toe with iron foundry owners and the central authorities who had permitted the foundry owners to take wood from a local forest common. 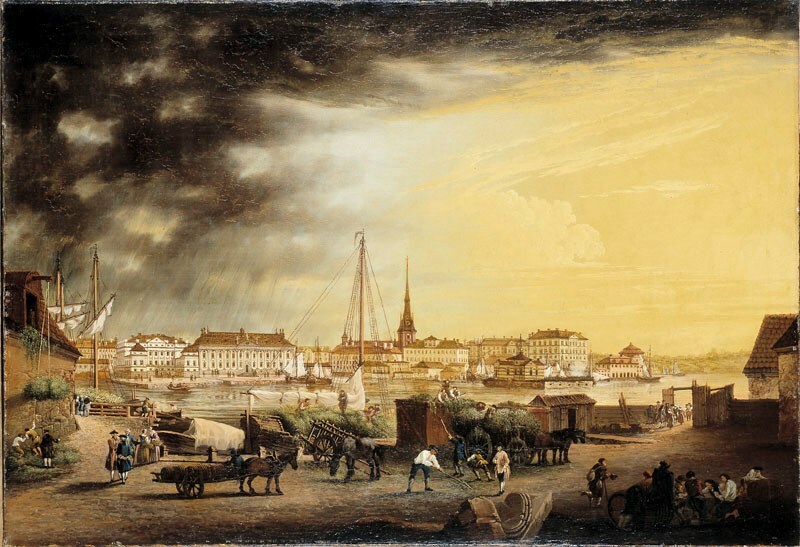 The city centre of eighteenth century Stockholm viewed from the south. To the left one can see the buildings where the nobility, the burghers and the peasantry convened during the diets. For these reasons, it was a bit surprising to me that I did not find many supplications from parishes when I was working on my dissertation. In the dissertation, The voice of the people? Supplications submitted to the Swedish Diet in the Age of Liberty, 1719–1772, I studied samples from the supplications submitted to the Diet in this fifty year era, more precisely to its committee tasked with receiving supplications – Urskillningsdeputationen, the Screening Deputation. The samples stem from the beginning, the middle and the end of the period. The wider aim of the study was to gauge the social width of the political conversation at the time, a time when the central political power was shifted from the King and his council to the Diet and its four estates – the nobility, the clergy, the burghers and the peasantry. The Diet met at least every third year, sometimes more often than that, and most of the time for a year or more. It was certainly a politically dynamic period in Sweden that saw the introduction of an early version of parliamentarianism, where members of the Council of the Realm were made accountable to the Diet and were regularly dismissed. The world’s oldest still existing Freedom of Press bill also saw the light of day in 1766. It was a time where people discussed politics publically like never before and where larger parts of society were able to participate in the political discourse. In contrast then the parishes did not turn directly to the Diet with supplications. Of the circa 1400 supplications I have studied there are not more than about 10 cases where parishes petitioned the Diet and if we exclude instances where parishes requested financial support for their parish churches not more than a handful of cases remain. In the sample from the early period, there is are two instances. In one the parishioners in Nora Parish, eastern Sweden, complained that the clergyman they wanted for their parish had not been chosen by the King-in-Council. At this point they then wanted clarification on what procedure should inform the appointment, seeing as their candidate had won in an election held in the parish hall. The second and similar complaint was raised by the Undenäs parish in the southwest of Sweden. In the sample from the late period there is one case where the parish can be said to have been used for political mobilization. In this instance the peasantries from three parishes in the west of Sweden protested against a decision made by the King-in-Council in 1769. According to this decision the peasantry in the area would foot the bill for the renovation and improvements of the local vicar residences in the district. Something they refused to do. Three parishes in the southwest of Sweden, complaining by way of petition about having to pay for the vicar residences in the area. As can be seen at the bottom, their diet delegate at the 1771-72 diet, Lars Torbjörnsson, submitted their supplication for them. 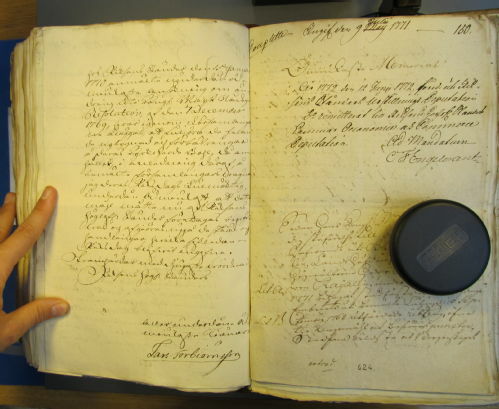 Taken from the Screening Deputation (part of the Age of Liberty Diet's records) in the Swedish National Archive (Riksarkivet) in Stockholm. Why did I not find more parishes in the samples? It is certainly a legitimate question to ask, especially when one considers that the Age of Liberty is a period relative political openness, especially compared to the preceding Caroline Absolutism (1680–1718). To a large extent, these meagre findings are a result of the channel I examined. In order to explain, we need to take some time to understand how the Swedish peasantry mobilized politically when it became time for the Diet to summon. Although a parish included people from all ranks of society, peasants composed the majority of the rural parishes’ population. The parishes in Sweden were indeed very busy before each diet. They elected delegates and furnished them with a list of complaints and requests, referred to as sockenbesvär, parish gravamina. The parish delegate then met with the other parish delegates in their härad, district. Under the watchful eye of häradshövdingen, the district judge, the various complaints were sorted and made coherent. The district judge also culled some of the grievances and sent them to the regional administration when the issues could be resolved at a local or regional level. The remaining gravamina, referred to as häradsbesvär, district gravamina, were handed to the district’s diet delegate or delegates who took them to Stockholm and the Diet. At the Diet the gravamina faced the final culling process, which was the same in the burgher estate and in the clergy. In this process, the gravamina were put in two piles. The gravamina that gathered the support of the entire state were put together and called allmänna besvär, common gravamina. These gravamina were referred to various diet committees for further examination. The other pile of gravamina were referred to as enskilda besvär, particular gravamina. They were returned to the diet delegates who had brought them to Stockholm, whose constituents expected that he do everything he could to get the gravamina successfully examined one way or another. Again, a gravamen’s possible path bifurcated. The diet delegate could either bring his gravamina to the King-in-Council, which was the expected path. However, as the Diet had created a committee tasked with receiving supplications from the Swedish subjects, diet delegates started seeing this committee as a viable way of getting their errands examined and decided upon successfully. Especially the burgher’s diet delegates used this back-up path into the Diet and accordingly, the second and third samples are filled with their errands as they adapted to the institutional playing field over time. The peasantry’s diet delegates did not however. As we have seen, the parishes were intrinsically involved in the political process but their errands did not end up in the Screening Deputation. Why? Well, first of all, it might simply be the case that the peasant estate was more successful in accommodating every diet delegate’s wishes than the burgher estate. Meaning, the common gravamina of the peasant estate could include most of grievances brought by the different delegates. The burgher estate was filled with inner tensions where towns competed against each other in a zero sum game over market access, tax reliefs and trade privileges and so on. It was harder to create a coherent package of gravamina that satisfied everyone’s wishes and many grievances had to be excluded. The peasantry’s diet delegates were thus perhaps not left with many particular gravamina after the final culling process had finished. Secondly, we must not forget the institutional preferences of the peasantry’s diet delegates. It might certainly be argued that they trusted the King-in-Council more than they trusted the Diet, despite having representation in the latter institution. Although the peasant estate was certainly structurally discriminated at the Diet – they were for example barred from the most important committee which decided upon foreign policy and taxes, among other things – they started gaining influence toward the last two decades of the Age of Liberty. Yet, even at their political peak at the 1771–72 Diet, their proposal for a package of peasant privileges among other things contained right for peasants to petition the king. The peasantry argued that a sound and ‘virtuous’ relationship between the king and the people necessitated that the latter could access to the former’s gracious and fatherly care. Perhaps most importantly, with regular information from his peasant subjects the king would be able to keep a watchful eye on the Crowns servants, something which in turn would spur the subjects to piety and diligence. Thus, the Age of Liberty is most likely a convenient period for the study of the political potential of the Swedish parish organisation. Studying the Diet’s Screening Deputation is however not suitable. The parishes’ political energy ended up elsewhere, such as the peasant estate’s common gravamina or in the King-in-Council. That is not to say that the supplications found in the Screening Deputation’s archives does not give us important access to a mostly unstudied channel for political interaction. It is however a story that does not involve the Swedish parishes.